What have the prophets of Israel to do with fancy dress balls? 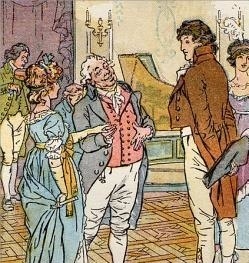 Advice for preachers from Jane Austen? Dress balls, pretentious social etiquette, and pursuing husbands. Sound like a nightmare? I know. I understand. To get past the fluff and frills, I recommend Peter Leithart’s Miniatures and Morals. Leithart’s literary analyses are fascinating and he helps you see that Jane Austen was a brilliant writer, story crafter, and character artisan. There is much more to her writing than balls, ribbons, and meddlesome matchmakers. Whether you ever read anything by Austen or not, I still think Leithart’s book is worth reading. As to her advice for preachers, it isn’t delivered directly. It is a statement about reading from her horror satire novel, Northanger Abbey. It is actually about taking the trouble to learn to read and that the difficulty is well worth it to be able to read. This quote has another application beyond the struggle to learn spelling, vocabulary, and grammar. It is also true of reading above your own head. The brain is like a muscle and reading like exercise. It stretches and strengthens the mind. Sherlock Holmes theorized the brain was “like a little empty attic” where the acquisition of knowledge was furnishing the room. He believed the walls were not elastic and after a time, each addition of knowledge caused the irretrievable loss of another piece of knowledge. While the human brain is certainly limited, I don’t think the detective had quite the right picture. Tolkien’s appraisal of the mind as a forest floor or compost heap is more apt. He spoke of the origin of his own stories as growing “like a seed in the dark out of the leaf-mould of the mind: out of all that has been seen or thought or read, that has long ago been forgotten, descending into the deeps.” 2 All that we see, hear, read, or think is thrown “on one’s personal compost-heap” to decompose into rich fertilizer for yields in the years ahead. The way to strengthen muscles is through progressive resistance. You keep lifting just beyond your ability until you are truly maxxed out. You strengthen your mind the same way. Read above your head and your capacity will grow. Be advised though that reading above your head is torturous for a time. Stick to it and you will steady out. Just one final word of caution. Remembering Tolkien’s metaphor, what you toss on the pile is not ready for immediate use. It needs time to break down and mix. Reading beyond your means can be frustrating, tormenting, and exhilarating. You will be tempted by the excitement to wax eloquent at once. Be patient. A fruitful harvest is not reaped immediately the field is plowed or seed sown, but it will come. So it is worthwhile to be tormented for a while by reading above your head to be able to read above your head for the rest of your life.